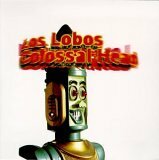 Los Lobos' latest studio album Colossal Head doesn't come close to capturing the energy of the band's concerts, and coming in the wake of its masterpiece Kiko, it also a bit of a letdown. Even so, it does provide a glimpse at the ensemble's stylistic range. From the pounding Mas Y Mas to the funky Revolution to the mariachi-band Maricela, Colossal Head covers a lot of territory. Little Feat fans should love Everybody Loves a Train and Manny's Bones, while This Bird's Gonna Fly conjures up images of John Lennon's early '70s performances with the Plastic Ono Band. Colossal Head is available from Barnes & Noble.